Trigger point release and Nerve Decompression therapy for migraines can help patients who suffer from persistent or daily migraines. Nearly 28 million Americans suffer from migraines, with daily persistent symptoms such as severe pain, nausea, aura, sensitivity to light, loss of appetite, dizziness, and fatigue. Migraine attacks can dramatically interfere with work, school performance and attendance, family events, and relationships. The nerves involved in migraines are divided into trigger points depending on where the headaches usually start: the frontal (forehead), temporal (temples), nasal, and occipital (back of head) areas. Trigger-point release or Nerve Decompression works by releasing the pressure on trigger sites and nerves and hence preventing migraines and persistent headaches or at least making them less frequent and with less intensity. The surgery has minimal complications and not a significant postsurgical down time. Bahman Guyuron, MD, a plastic surgeon at Case Western Reserve University, first designed these groundbreaking operations in mid 2000. Currently, there are several migraine surgeons in the world (typically, peripheral nerve surgeons and plastic surgeons) who are trained to correctly identify these trigger sites. Many patients have reported relief from their pain, and numerous publications in the past 12 years have supported the efficacy of this surgical procedure. In general, 85% to 92% of the patients experience 50% or more reduction in headache frequency and severity. In addition, 50% to 60% of patients have complete resolution of headaches. Individual results may vary depending on each case. Patient selection requires thorough analysis of the clinical history and neurologic examination results. The first step in the management of migraine headaches involves a neurological evaluation and medical treatment. The surgery currently is reserved for failure of such therapy. 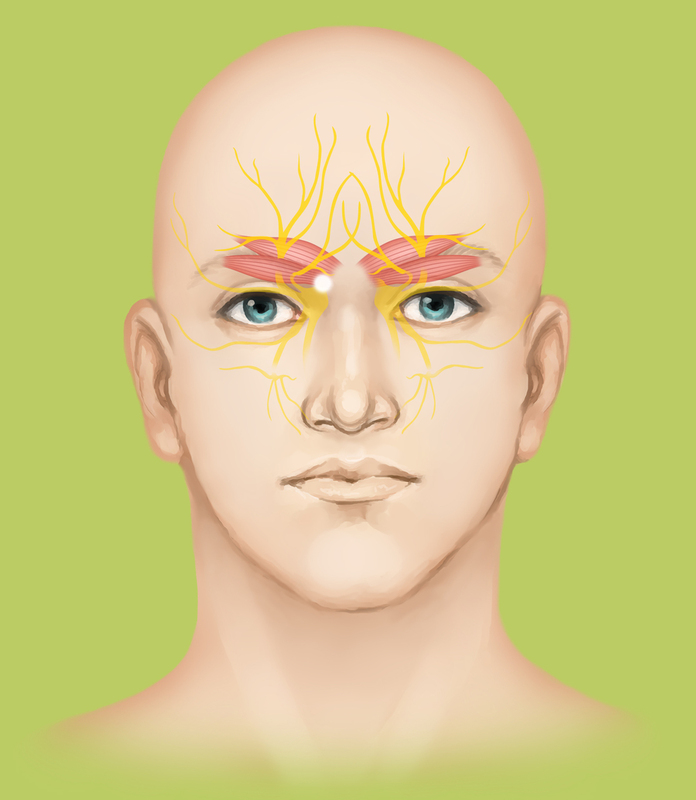 A migraine surgeon or neurologist will identify the trigger points using a thorough examination, BOTOX® or nerve blocks. Small incisions hidden in the eyelid or behind the hairlines are then made. The entrapping muscles and fascia are either partially or completely removed. In some instances, when the nerve endings are too small, they are sacrificed without a considerable deficit. This procedure results in soothing the nerve endings, which prevents the migraine or persistent headaches from occurring. Four different types of migraine and daily persistent headaches have been defined based on their trigger point location. Sometimes the alleviation of one trigger site results in the unmasking of a second site. The Amirlak Method, which is unique to UT Southwestern, is similar to the traditional method that decompresses the nerves in the forehead, temple, the back of the neck, and sometimes relies on sinus surgery, but it also addresses the smaller blood vessels. Dr. Amirlak uses an endoscope to visualize small areas of compression on the greater occipital nerve, and the method involves thorough decompression and ligation of the small branches of the occipital artery, which may be pressing against the occipital nerve in the back of the neck. This technique is being considered to be published in peer reviewed journals and has been presented in local and national meetings. This provided an additional form of decompression on top of what was described before in Cleveland. The pain typically starts above the eyebrows. Treatment involves decompressing the supraorbital and supratrochlear nerves in the glabellar area by resecting the corrugator and depressor supercilii muscles using a minimally invasive endoscopic approach similar to that used for a cosmetic forehead lift. Supraorbital and supratrochlear nerves are decompressed. 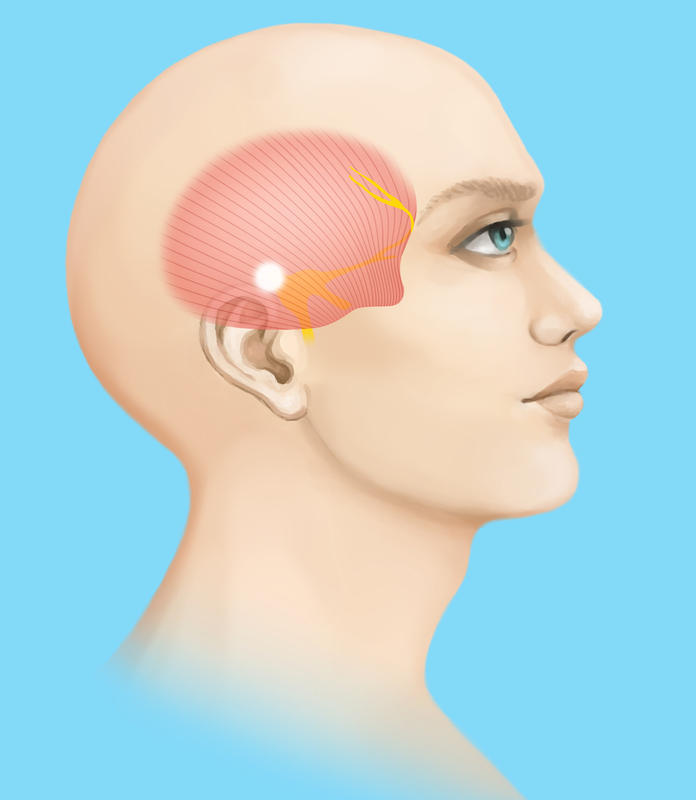 Pain in the temporal area, where the zygomaticotemporal branch of the trigeminal nerve passes through the temporalis muscle, is treated using a similar endoscopic approach but involves removing a segment of the nerve rather than decompressing it. 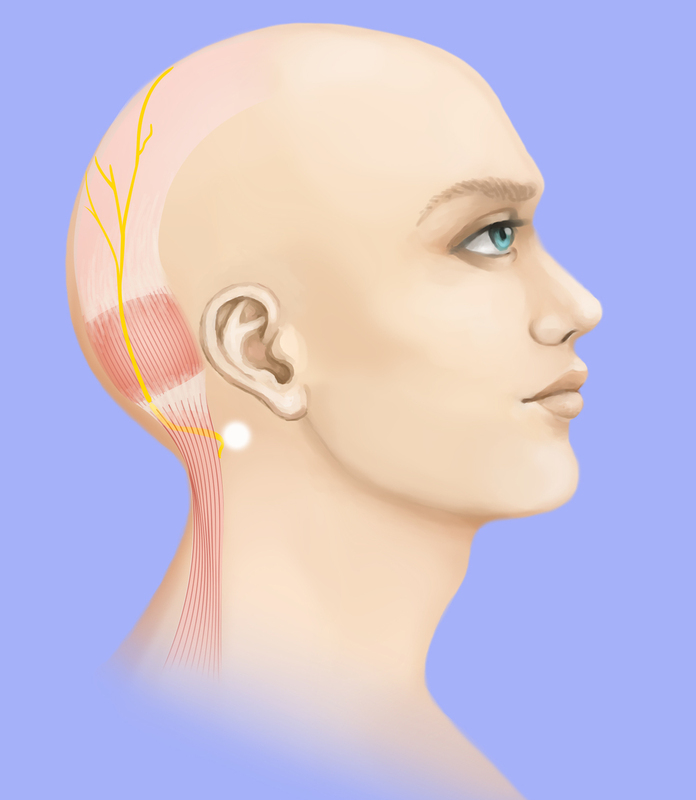 This procedure results in a slight sensory defect over the temporal skin area, but innervation from other sensory nerves helps to limit the deficit.Other nerves can be involved in the temple which are addressed such as the auriculotemporal nerve. A small branch of the trigeminal nerve in the temple is excised. The pain typically arises from behind the eye. 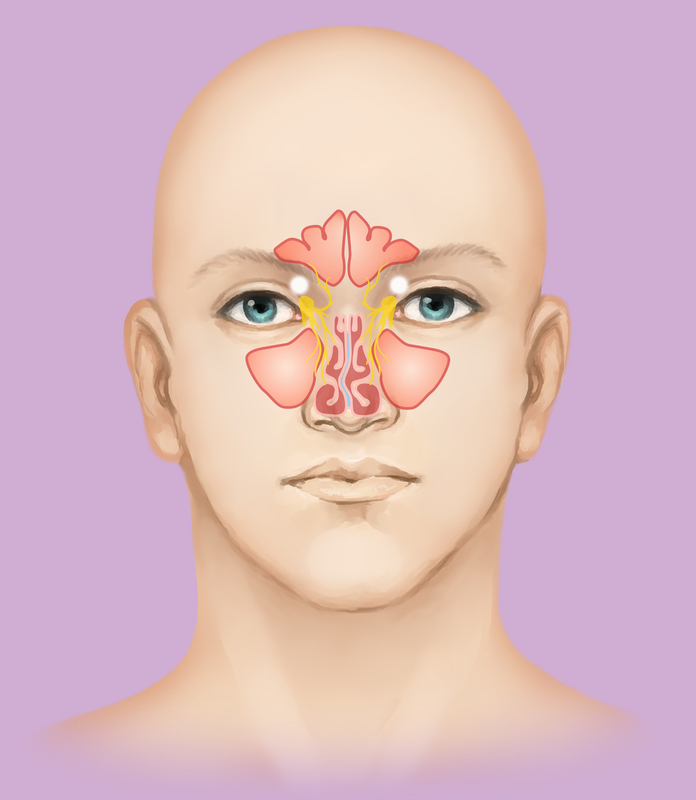 The nasal trigger points, where enlarged turbinates are in contact with the nasal septum, are addressed with septoplasty and turbinectomy. Contact points within the nose are addressed. This pain originates in the back of the neck. The posterior neck area where the greater occipital nerve passes through the semispinalis capitis muscle is treated with a combination of endoscopic and open surgical approach (3-cm incision hidden in the hairline), with resection of a small segment of the semispinalis muscle, releasing several compression areas on the occipital nerves and shielding the nerves with a fat flap.The areas involving the lesser and third occipital nerve may have to be addressed as well which are lower on the neck.